Can death be cheated? Should it be? With language as sharply honed as a knife, DeLillo raises existential questions that are closely tied to the modern world we live in - a world of technologies that we can barely keep up with. Jeffrey Lockhart, son of billionaire Ross, is brought to a secret compound far from civilization to witness his stepmother’s death. Primarily funded by Ross, and years in development, this is where people come to experience death as a precisely controlled event and to have their bodies preserved so that they may someday be revived. Jeff is alternately appalled and fascinated by the surreal environment in which he finds himself. DeLillo’s characters expose themselves so intimately that it seems almost voyeuristic. They debate modern technology and ancient ritual, father and son, man and woman, isolation and community, life and death. DeLillo, turning 80 this year, has written an unpredictable and thought-provoking novel that isn’t about death, but rather on the fine line between living and dying. "One of the most mysterious, emotionally moving and formally rewarding books of DeLillo's long carer... Unexpectedly touching... [DeLillo offers] consolation simply by enacting so well the mystery and awe of the real world... I finished it stunned and grateful." "Among DeLillo's finest work... DeLillo sneaks a heartbreaking story of a son attempting to reconnect with his father into his thought-provoking novel." "Lush in thought and feeling... Intently observant and obsessively concerned with language and meaning, Jeffery is a mesmerizing and disquieting narrator as he describes the “eerie and disembodying” ambiance of the Convergence and its ritualized, morally murky amalgam of mysticism and science, from the “post-mortem décor,” punctuated by unnerving sculptures and violent cinematic montages, to the sarcophagus-pods containing naked, cryopreserved voyagers to the unknown... DeLillo infuses the drama with metaphysical riddles: What of ourselves can actually be preserved? What will resurrection pilgrims experience in their cold limbo? With immortality reserved for the elite, what will become of the rest of humanity on our pillaged, bloodied, extinction-plagued planet? 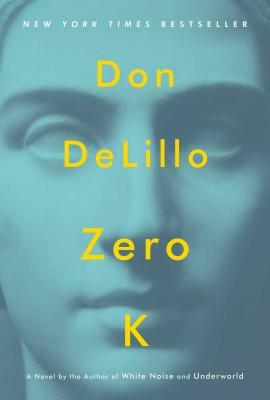 In this magnificently edgy and profoundly inquisitive tale, DeLillo reflects on what we remember and forget, what we treasure and destroy, and what we fail to do for each other and for life itself... DeLillo reaffirms his standing as one of the world’s most significant writers." "Resplendently insightful... an engrossing work of narrative art... rare and extraordinary." "[DeLillo is] the master of the pre-apocalyptic novel, the chief literary mapper of the dehumanized places our current world may lead us. [He] is near the top of his game in Zero K."
"Zero K pushes its readers to feel. It is almost impossible to not. With its confluence of screens, strange artwork, empty rooms, long hallways, and shaved hands of those soon to be frozen, Zero K creates an experiment, and we, its subjects, feel pulled to interact."